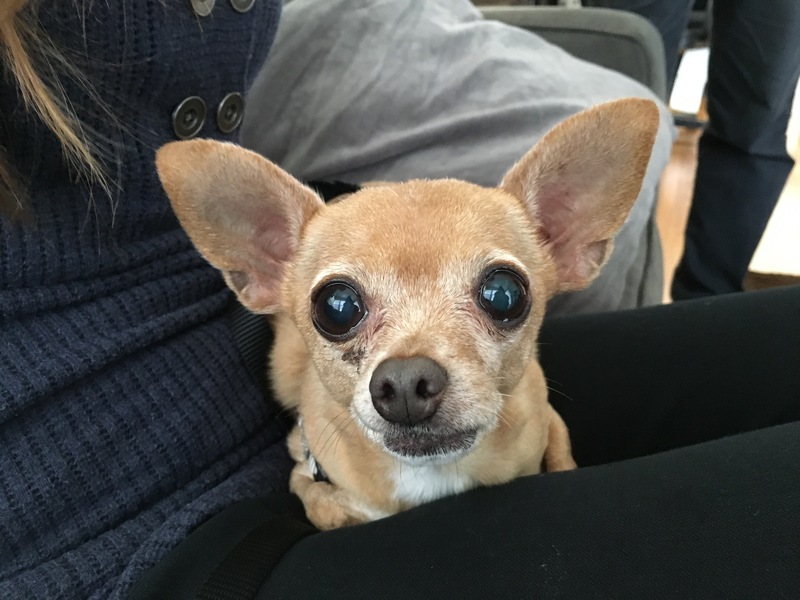 Mia is a nine-year-old Chihuahua in Los Angeles who is anxious, fearful and sometimes aggressive when other people are nearby. Her guardian called me in to help stop her fearful nature now that she has moved in with her boyfriend (who Mia is still fearful of). I could instantly tell that Mia was anxious and nervous with my presence by her behavior; barking, stiff body, lowered head, dilated pupils, tucked tail and the distance she stood at – as far away from me as possible. But what most concerned me was her repeated walking in circles movement. This is a sign that a dog is under stress and unsure how to proceed or get away. I sat down with her guardians to discuss the situation and give Mia a chance to calm down a bit. After a few movements Mia was continuing to walk in small circles so I had her guardian a harness on so I could stop this behavior. It took Mia a second to realize that the leash was under my foot blocking her from moving away. As soon as she did she panicked a bit so I made sure to stay still and let her calm herself down. Many humans want to try to prove to the dog that they are a good person or calm it down by petting it. But when a dog is in an unbalanced state and we provide it with attention or affection, we are agreeing with the unbalanced behavior. I learned that Mia’s guardian had been attempting to help the dog get over her fears with love and attention, but the reality is she was actually reinforcing the exact behavior she was trying to abate. To help Mia get over her fear of strangers, I used a method called Flooding. Flooding involves exposing the subject to a low level of stimulation they do not like at a distance that allows them to process the situation while ensuring nothing bad happens. While I stood on the leash to block the dog from engaging her flight mode (running away), I did not try to pet, talk to, look at or interact with the dog in any way. My sole goal was to have her learn that she can stand or sit next to a human without anything bad happening. While humans think of dog petting and giving of affection is a good thing, if the dog is in a fearful or unbalanced state, this would be too much and interpreted as the dog as a “bad” thing. I suggested that they practice this technique when the dog self isolates or leaves the room while the boyfriend is there as well as when make guests arrive that she seems nervous around. The more time the dog spends around people who show no interest in her until she initiates it with them, the better equipped she will be to deal with new people in the future. It took about 15 minutes, but eventually Mia calmed down and relaxed. I knew this was starting to be the case when started to sit and that she was completely calm when she laid down next to me. Now that Mia had returned to a calm state of mind, I could start work on her rehabilitation. I asked her guardian what rules and structure Mia had in her life. While humans like to feel unencumbered by rules and limits, fearful dogs do much better with boundaries and limits. These help the dog see and identify the human as being in the authority position which means the dog doesn’t have to worry about things like pack security. But in Mia’s case, her guardian had few rules or limits. This was likely part of the reason the dog was so anxious. But another big factor was the guardian picking up the dog or petting Mia when she nudged, pawed at or jumped up on the guardian. Basically the dog was telling the guardian to do something (Pet me!) and each time the guardian did so, she was telling the dog she was the boss of the humans. This perception of authority over the humans causes most dogs to be a little anxious. But when you have a dog who is also fearful, that combination can be debilitating to the dog. To help stop this, I suggested some simple rules and boundaries for the humans to introduce and enforce. Once the dog sees and respects these, she will assume more of a follower mindset and a good portion of her fear fill dissipate. I also suggested that they practice what I call Petting with a Purpose. Whenever I’m dealing with a fearful or insecure dog, I look for ways to boost their self esteem and confidence. Just like humans, dogs feel a sense of pride when they master a new skill. To this end I suggested that her guardian find a few new tricks on Youtube and teach the dog a new one each week for two months. By focusing on teaching one new command or trick each week, we can gradually help the dog start to feel better about herself while also deepening the bond between human and canine. This also gives us more avenues to communicate and interact with the dog. This sort of development and interaction can have a positive long term impact on the dog and its relationship with humans. Another way to help a dog feel more comfortable is to communicate with it in ways it understands. The native tongue of dogs is body language which consists of; posture, position and movement. Many people talk to their dogs as if the dog speaks English. The fact of the matter is dogs only know a small number of words. Those that are introduced and reinforced with good timing become a part of the dog’s vocabulary. But just like a human who is learning a new language, the more words used, the easier it is to loose track. Really your tone is more important that the content of your conversation when speaking with dogs. I wanted to give Mia’s guardians a new way for them to communicate with the dog that was closer to her native language so I went over a series of escalating consequences I prefer to use when a dog does something I disagree with. It will take the humans in the home a week or two before these escalating consequences become second nature to them. Once this is the case, they will be able to communicate or disagree with the dog without saying a word. At first, the guardians will need to use all of the escalating consequences, but if they do so consistently they will notice the dog responding quicker and with fewer corrections. With enough time and practice, the guardians will eventually only need to use the first consequence, the hissing sound to disagree. I advised the boyfriend to learn the escalating consequences but not actively use them right now. Ideally all corrections should come from the dog’s primary at first so that the boyfriend can exclusively focus on eliminating the dog’s fears. To help the dog get over her fearful perception of the boyfriend, I pulled out some high value treats and showed the humans how they can use them to motivate Mia to come closer to the boyfriend. When we rush a dog into something or physical position them, they instinctively resist. But because I let the dog take its time, Mia was open to the situation and didn’t feel overwhelmed or rushed. I made sure to remain as still as possible when running through this exercise. A loud noise or movement at the wrong time can be catastrophic in the rehabilitation process. But even with my patience and experience, it ultimately took the manipulation of a treat by the dog’s primary guardian to help Mia get over the hardest obstacle; taking the treat off my foot. Now that Mia was feeling more confident in moving forward, we repeated the process but this time to entice the dog to approach her guardian’s boyfriend. The treat trails exercise I introduced in the above video is something MIa’s guardians can repeat to help the dog build up a positive association around the boyfriend. And because she gets a positive reinforcer each time she moves forward or closer to him, she is more motivated to do so in the future. Shortly after I started the session, Mia’s guardian had commented that my pulling out a leash had distracted the dog as she was associating its presence with the enjoyment of going for a walk. I decided to use this to help with her rehabilitation by taking her out for a short walk myself. At first Mia was withdrawn, hesitant and timid; looking back repeatedly for her guardian to come along. With the guardian was nowhere in sight, the sights and sounds of the neighborhood were starting to catch her attention as we walked. It was great to see Mia’s body language and energy change as she started to take in her surroundings. The more she walked, the less fearful and more confident she got. By the end of the walk, she was truly enjoying herself. I returned to her home so that I could guide her guardian’s boyfriend through this exercise. I had the primary guardian stay inside to make sure that this experience was strictly between the boyfriend and chihuahua. This was a challenging, but rewarding session. Mia had clearly been suffering through a great deal of anxiety and fear. This was reinforced by the attention her guardian gave her while trying to comfort and soothe the dog. But now that the guardian knows how and when to provide attention to have a positive affect on her dog, Mia’s journey to a better mental place has begun. It had only been a few hours, but Mia was noticeably calmer. When I started the session, the dog’s head was on a swivel and she was pacing circles when she wasn’t trying to run away. But as we finished up the session, she was sitting and laying down with a relaxed body posture and position. By petting with a purpose, adding rules and structure and using the new escalating consequences, Mia’s guardian will be able to build up her confidence and ease her fears. As the dog gets more confident and comfortable and she practices being around and walking with the boyfriend, her interaction with him should improve significantly.